Trapped inside the City walls, Eve uncovers a shocking secret about her past -and is forced to confront the harsh reality of her future. When she discovers Caleb is alive, Eve attempts to flee her prison so they can be together - but the consequences could be deadly. She must make a desperate choice to save the ones she loves…or risk losing Caleb forever. Once is the second book in the Eve trilogy. When we left Eve at the end of the first book, things were very uncertain. Her whole life had been turned upside down, she discovered everything she knew was a lie, and she was on the run. Those themes carried over nicely into Once. I like the direction this trilogy is taking - it’s different from other dystopian novels, where the characters are in the wild and it’s all about survival. This is more about politics within the City of Sand, and rebuilding but at a price. While I enjoyed the storyline and the twists and turns, the whole thing seemed to lack a sense of urgency. Eve kept saying she was trapped, but that feeling didn’t really come across for me. The New America was quite interesting. It’s similar enough to our world to be relatable, but there are also enough things that are slightly off to give you that kind of creepy post-apocalyptic vibe of a world that’s experienced a major disaster and is no longer the world as we know it. I liked the new characters and plot twists introduced in this second installment, and the reappearance of familiar characters. Eve doesn’t know who she can trust, and it seems like her whole life is full of secrets, lies, and betrayal. I didn’t connect with the romance between her and Caleb as much as I did in the first book, but I still hold out hope for them in the next book. The end was very exciting and left me itching for the final book in the trilogy. I can’t imagine how things are going to play out, but I’m looking forward to finding out. Overall, Once was a very enjoyable story, and if you haven’t begun this trilogy yet, I really encourage you to. Have you read Eve or Once? What did you think? Haven't read 'em yet, but maybe I need to get them on the list. 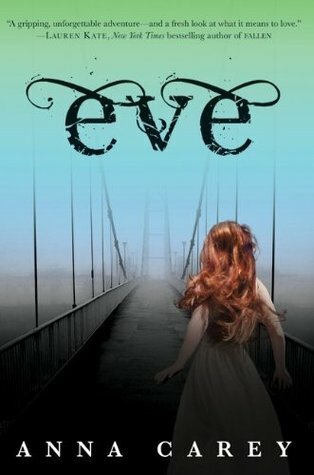 I've read both EVE/ONCE, and while I like them, there's just something missing for me. I think it's that Eve doesn't feel very authentic. Now if Arden were the narrator, I'd be all over those books. To me, Eve just doesn't translate her surroundings/emotions well. But the story itself is very interesting!